A man's tie says a lot about him: stripes and bold colors denote power, a bowtie shows he's got a little old-school in him, and one that spins indicates that yeah, under any circumstances, his car's got room to give you a ride. Get one that says "Mom probably doesn't want me wearing this on holidays", from Cyberoptix. Just hitting the District's shelves, Cyberoptix's a Detroit-based haberdasher cranking out hand-printed neckwear with intricate, oft-edgy patterns in an effort to turn the "much maligned business necessity into a subversive object of desire" -- though good luck getting Fight Club Brad Pitt's abs onto a tie! Neck-couterments come sized standard, "narrow", or "skinny", with just-dropped styles including musical-hipness like the minimalist, art deco-looking "Vinyl Record", and "Turntable" (with a hand-drawn Technics 1200 rig), and booze-infused designs like the silvery-wormwood-leafed "Absinthe" and "Beer! 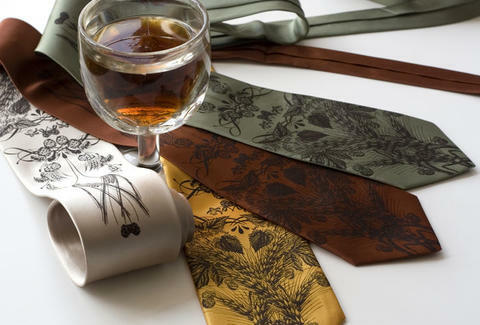 ", covered with botanical prints of hops/barley/wheat, and available in "hues of lager, hefeweizen, Belgian ale, and stout" -- a sudsy color pallet that generally only graces the tip of your tie. Other themed newness includes the car culture/general Detriot-ish "Crash Series", including the stick-celebrating "Gear Shift" imbued with a Volkswagen GTI shift knob, the tire-marked "Tread Lightly", and the broken glass-patterned "Crash", a reminder of the time you just narrowly Cheadled death. Ever expanding their jugular juggernaut, Cyber's also just released a cache of printed bowties, your wearing of which will say about you "I just had some clown tie my bowtie for me".